Lyon, the Capital of Lights, so named because of its annual festival of illuminations, is so much more than the gastronomic reputation that precedes it. While you certainly shouldn’t leave without sampling the food, there are plenty of other attractions to sink your teeth into. Here are some of the best spots to check out when you’re up against the clock. Choice and individuality are prized by this deliciously cosy cafe; their name translates as ​‘To each his cup’, and, accordingly, there’s an astounding range of teas and coffees available. The honey-coloured interior is warmly lit, and plenty of comfy armchairs await travellers in need of a pick-me-up. Savour a couple of cookies or a moreish pastry alongside an indulgent salted butter caramel oolong tea, and try not to sigh with pleasure too audibly. Centrally located at the end of Rue Romarin, this cafe is an excellent pit stop if you need a calming place to wind down before a meeting or connection. Treat yourself at the Secrets d’Apiculteur. Credit: Secrets d’Apiculteur delicatessen. If you make one purchase in Lyon, whether it’s for yourself, a loved one or a colleague, make sure it’s from Secrets d’Apiculteur. This delicatessen sells some of the most enticing delights in the city, including honey featuring floral, woody, fruity and even spicy flavours. There’s plenty more to set your taste buds alight if you aren’t seduced by the selection of liquid gold. Treat your sweet tooth to a jar of sugar-coated bonbons, or perhaps some handmade gingerbread. There’s even a bee whisky and honey liqueur which begs to be sipped with a few friends on a special occasion. If you’re planning on taking some purchases home, the sleek, minimalist labelling won’t look too shabby on your shelf, either. Lyonnais food is world renowned, so you can hardly visit the city without taking some time to eat out. Head to Le Passage to experience traditional French fare in boudoir-inspired surroundings. The deep reds of this restaurant’s décor provide a glimpse into the cuisine on offer here: rich, elegant and opulent. Try the salty sweet roasted langoustine with saffron parsnip cream and Jerusalem artichoke cake, or the decadent Guanaja vanilla and hot chocolate ice cream. After dinner, the warm atmosphere of the bar beckons; sit back with a drink, surrounded by lavish burgundy drapes and the sound of gentle jazz music. Wander through the Cathedral Saint-Jean in Vieux Lyon, France. Credit: Getty Images. To avoid disruption at the existing cathedral, this landmark replaced it piece by piece over several centuries – a process evident from the mishmash of architectural styles on show. While the imposing gothic facade of the ​‘Primatiale’, as it’s also known, is a masterpiece, be sure to head inside the cathedral to see the astronomical clock – a wonderful feat of classical engineering. It’s currently accurate until 2019 and features a number of automated angels and figures that move according to the hour in an intricate mechanical ballet. If you happen to be visiting during the Festival of Lights (normally between the 8th and 10th December), you’ll see the cathedral bathed in spectacularly vivid colours after dark. 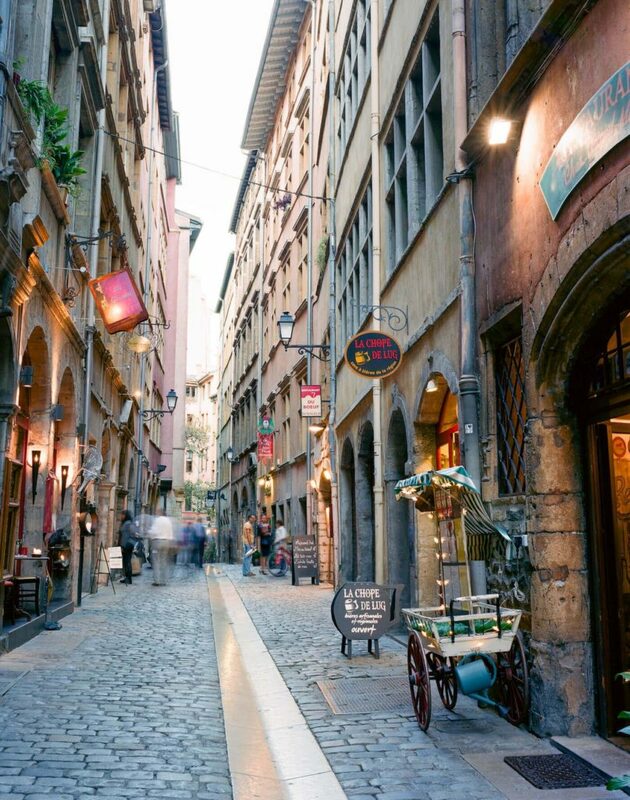 Promenade around the oldest parts of Lyon in France. Credit: Getty Images. 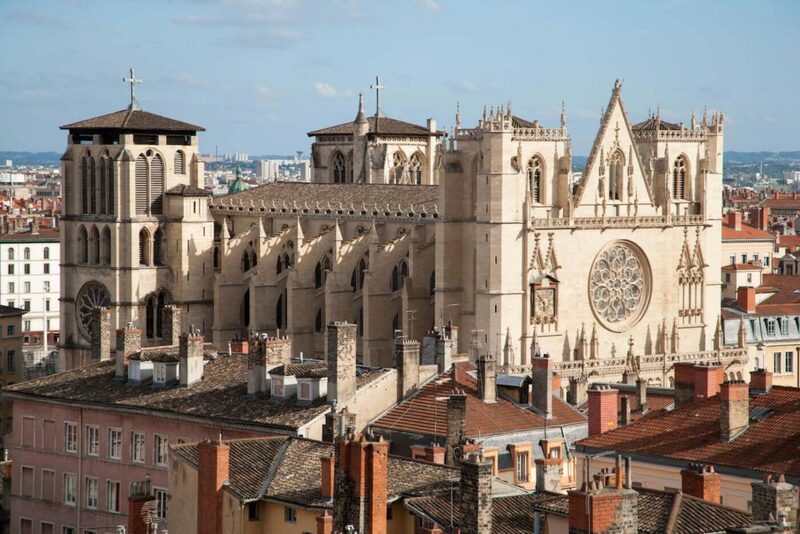 If you have more time after visiting the Saint-Jean Cathedral, continue on to explore the labyrinthine streets of Vieux Lyon. This district is the oldest in the city and is split in to three sections, each featuring distinct landmarks. The Saint Jean quarter, where you’ll find the cathedral, is also home to a fascinating museum dedicated to miniatures and film sets. Then there’s the Saint George quarter, which features ​‘traboules’, secret passageways originally used to allow the district’s silk weavers to travel between buildings with their goods. Finally, the Saint Paul quarter has two superb museums: The Lyon Historical Museum, which traces the city’s origins back to pre-Roman times, and the International Puppet Museum. With three hours to spare, you may not be able to take it all in, but don’t rush – wandering the streets alone is a trip worth savouring. This traditional British pub is a local landmark, known for its friendly crowds. There are regular football match showings, as well as live music on selected evenings – if you need to blow off some steam during your visit, look no further. Drinks wise, this pub has a good selection of British and Belgian draft beers, and the place is somewhat known for playing a variety of British bands, so music fans should feel right at home. The interior is cosy, which means you should get a place at the bar as early as you can if you’re planning on enjoying a few cold ones here. The pub quiz, which is rumoured to be the longest running in the city, is great fun if you happen to catch it.